Itinerary & price follows below. Birding, as it were, in a "tropical frontier"
Honduras, the second-largest country in Central America, is a land of mountains and forests, of beaches and coral, of mangroves and wilderness. It has a veritable cornucopia of habitats, with a pristine quality to much of the environment. It is the most mountainous of Central American countries. It has the largest extent of remaining forest in Central America, about 40 per cent of the land area. Tropical rain forest covers the lowlands of the Caribbean side. Honduras has more beaches than any other Central American country, with over 500 miles of coastline, much of it laden with mangroves. Caribbean coast beaches have white sand. On along the Pacific, black sand. A number of natural habitats will be visited during this birding tour. Just over 700 species of birds have been recorded in Honduras (probably more occur). 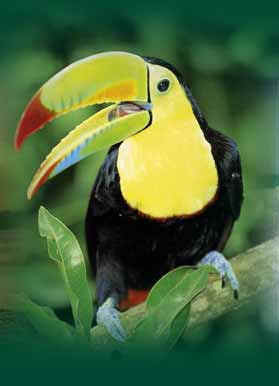 Among the 700-plus: Harpy Eagle, Jabiru, Scarlet Macaw and various parrots, toucans and trogons, motmots and manakins. 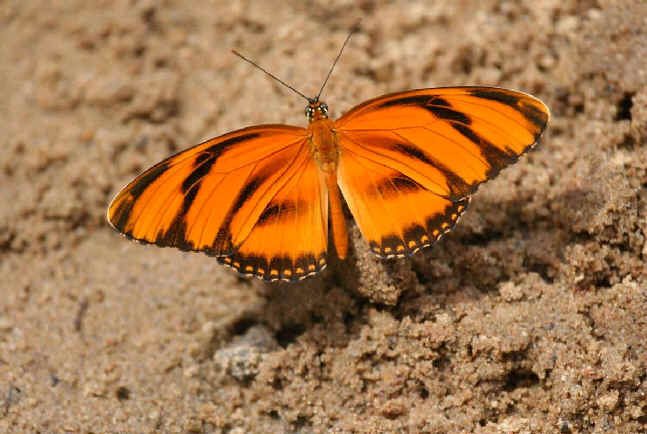 Honduras is largely undiscovered probably because it is widely misunderstood. You may wish to visit Honduras so as to visit a fine "natural destination" to which few people have been. and leader of previous FONT Honduran birding tours. Tue. Jan 5 Arrival San Pedro Sula, Honduras. Transfer to hotel. Overnight in San Pedro Sula. Wed. Jan 6 Travel by road, with birding enroute, to Cop�n Ruinas, a picturesque village. Once there, in the afternoon, there will be some fine birding in the area, with a number of neotropical species, among them: tanagers and toucanets, orioles, motmots, and more. Overnight near Cop�n. Thu. Jan 7 This day, birding, as always, but also a visit to the legendary Archaeological Park of Cop�n, consisting of two main sites, the Ruins and the Sepulchres. We will see the amazing 63 step stairway with over 2,500 hieroglyphs and the masterfully carved Stella. 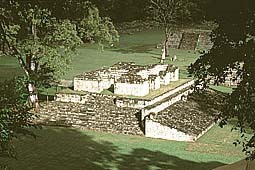 Those who wish can visit the Museum of Mayan Sculpture. In the afternoon, more birding in the Copan Valley. Another overnight near Cop�n. Fri. Jan 8 Travel to Lake Yojoa, via Santa Barbara, a typical Honduran rural town. In addition to the lake, we�ll also bird in the Los Naranjos Ecology Park, where we should see motmots, oropendolas, and a variety of tanagers, euphonias, and honeycreepers. In the past, here, we had the good fortune of seeing 2 Striped Owls. Overnight at Lake Yojoa. Sat. Jan 9 Lake Yojoa is a natural paradise, an area containing one of the richest avifaunas in Central America, with numerous species of birds. In the morning, we�ll explore the lake edges for Black-bellied and Fulvous Whistling Ducks, Bare-throated Tiger-Heron, and Limpkin, along with a variety of other waterbirds. After lunch, we travel to Tela. Enroute, we�ll do some birding in the area of the spectacular Pulphanzak Waterfall. Overnight in Tela, along the beautiful Caribbean coast. Sun. 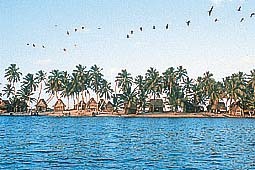 Jan 10 This day we�ll visit the Los Micos Lagoon, separated from the sea by narrow tongue of sand. The lagoon is surrounded by mangroves. In the area there are many canals and cays, with a nice assortment of plant-life and birds, including Boat-billed and possibly Agami Herons, Roseate Spoonbill, White Ibis, and other waterbirds. We've seen Jabiru in this area in the past. Again, we�ll explore the region, seeing the birds, in the mangroves and lagoons and along the canals, by boat. Nearby, at dusk, we'll do some birding where during our April 2003 tour we found Yucatan Nightjar (a rarity in Honduras, only found to be in the country as recently as 1990). Overnight again in Tela. Mon. Jan 11 Early in the morning we�ll visit the Lancetilla Gardens, founded over 70 years ago as an experimental botanical site. In these gardens, in which there are various hardwoods, flowering plants, and tropical fruit trees, there are many birds, including becards, attilas, tityras, and maybe a cotinga. Also an assortment of hummingbirds such as the Purple-crowned-Fairy, along with numerous toucans, trogons, tanagers, honeycreepers, euphonias, motmots, parrots, wrens, flycatchers, and antbirds. In the afternoon, we�ll head toward the Pico Bonito National Park, where the good birding will continue. Overnight near Pico Bonito, in fine facilities, in a fine birding environment. Tue. Jan 12 This day there will be birding and exploration in the area of Pico Bonito National Park. At the edge of the park, we'll bird among coffee and cacao plantations, and in adjacent forest. These habitats, needless to say, will provide some great birding. Among the many birds, species would include numerous hummingbirds, trogons, motmots, flycatchers, and tanagers. Among the motmots, could be two especially nice to see: the Tody and the Keel-billed. In the afternoon, we'll visit the Zacate Waterfalls, where if the timing is right, we should see White-collared Swifts. Other birds in the area could include Sunbittern, Tawny-crowned Greenlet, and Buff-rumped Warbler. Overnight again near Pico Bonito. Wed. Jan 13 In the morning, this day, some more birding and exploration in the area of Pico Bonito National Park. At the edge of the park, we'll bird among coffee and cacao plantations, and in the adjacent forest. These habitats, needless to say, will provide some great birding. 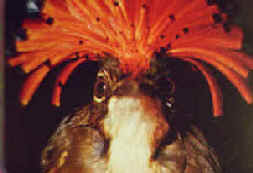 Among the many birds, species would include numerous hummingbirds, trogons, motmots, flycatchers, and tanagers. Among the motmots, could be two especially nice to see: the Tody and the Keel-billed. In the late -afternoon, travel by road to Olanchito. Overnight accommodations there will be more modest, but we'll be near some prime birding. Thu. Jan 14 Birding this day in the Upper Aguan Valley, a dry area, with tall prickly pear, organpipe cacti, and thorn forest. In the last of these, our prime avian target, a hummingbird called the Honduran Emerald. Of the 700-plus species of birds that have been recorded in Honduras, there's only one endemic. It's the Honduran Emerald, a rarity considered critically threatened by Birdlife International. It was known from 11 specimens taken prior to 1950 and was not seen again until 1988. Now it's known to be in the Upper Aguan Valley, as are isolated subspecies of the White-bellied Wren and Green-backed Sparrow. Other birds in the area include: Thicket Tinamou, Double-striped Thick-knee, Lesser Ground-Cuckoo, Lesser Roadrunner, and White-lored Gnatcatcher. Overnight near Ceiba, to be in position for the flight the next morning from there to San Pedro Sula, to connect with flights home. Fri. Jan 15 The morning flight from Ceiba to to the international airport at San Pedro Sula for departure home from Honduras. All meals (except first & last days). Entrance fees to national parks, etc. Services of the FONT birding leader. Drinks & any items of a personal nature. "Focus on Nature Tours" can arrange air travel, seeking the best possible air fare. A deposit of US$ 500, per person, will assure a place on the tour.